This morning, the British Library tweeted that a manuscript of Henry of Huntington’s Historia Anglorum, Arundel MS 48, had just been digitized, so, rather than get into some real writing, I took a brief tour. Among its many treasures (so many marginal faces! ), including a cute little miter, I found this bit, where Brutus seeks an omen from Diana about his future. Here’s a 19th-century edition of the Latin, if you like. You’ll notice, however, that a much later commentator has issues. Earlier, they had complained about the avarice of contemporary clerics; here, they write ‘de veritate huius, doctores dubita[n]t’, ‘about the truth of this, theologians/scholars/teachers doubt.’ Of course Brutus didn’t hear from a sylvan goddess about his future passage to Britain! That’d be absurd! 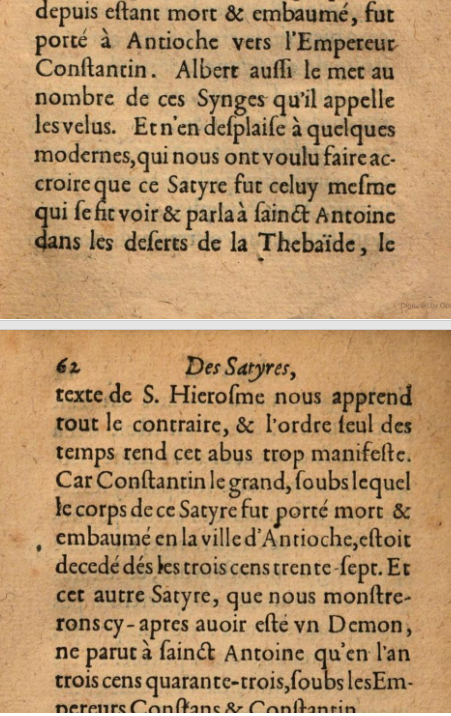 I’m reminded, as I’m sure you are, of François Hédelin, whose 1627 treatise, Des satyres, brutes, monstres et démons, takes up the question of the famous talking satyr from Jerome’s Life of Saint Paul, the First Hermit. It’s perhaps a hard story to believe. Jerome himself offered proof, namely, that the corpse was sent along, salted, to the emperor in Antioch [postea cadauer exanime, ne calore aestatis dissiparetur, sale infusum et Antiochiam, ut ab Imperatore uideretur, adlatum est]. The skeptical and scientific Hédelin, however, insists that Constantine was already dead, so clearly this was impossible. And, anyway, the corpse must have been a monkey. As for the talking satyr? Obviously a demon. This entry was posted in MedievalBlog and tagged manuscripts, medieval primary texts, medieval studies, science by medievalkarl. Bookmark the permalink.